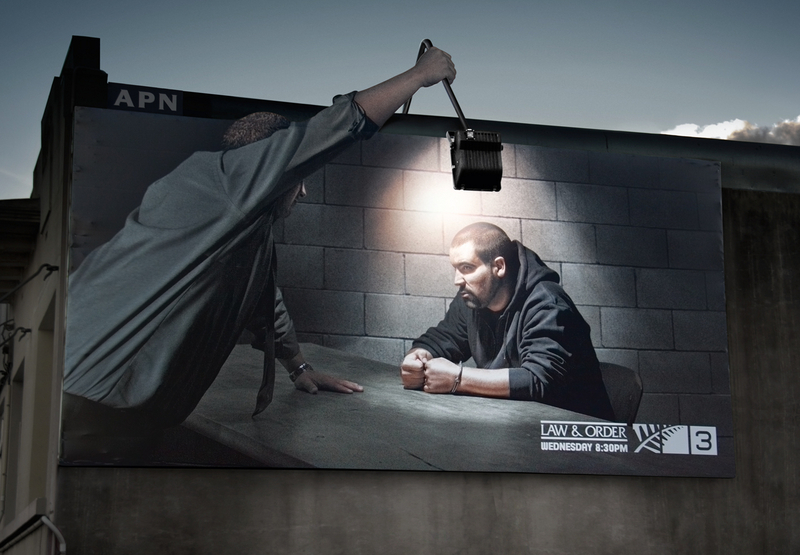 TV3‘s screening of Law and Order, Wednesdays at 9.30 pm, was promoted in New Zealand with a billboard featuring an innovative use of lighting. Using a standard police interrogation technique this detective grabs and bends the fitted billboard light to question his suspect. The Law and Order billboard was developed for TV3 by Colenso BBDO, Auckland by executive creative director Nick Worthington, art director/copywriter Lisa Fedyszyn, creative director Steve Cochran, deputy creative director Karl W Fleet, copywriter/art director Jonathan McMahon, producer Paul Courtney, photographer Troy Goodall and retoucher Kevin Hyde at Imagecraft.